Update Update: This story has been updated to reflect that the SFPD has apparently changed its story about the iPhone 5 search. The San Francisco Police Department has told a local paper that plainclothes police accompanied two Apple security officials to the home of a local man in search of a lost iPhone 5 prototype. According to SF Weekly, San Francisco resident Sergio Calderón said he was visited by six people claiming to be police looking for an unnamed phone they tracked to his home via GPS, and the paper identified one of the six was an Apple "senior investigator". San Francisco police originally told SF Weekly that they had no record of such a visit, but according to the paper, the police department has now reversed its stance, saying that the plainclothes police stayed outside the home while the Apple employees searched it. When contacted for comment, a San Francisco Police representative said that our message would be given to Lt. Troy Dangerfield, who is cited in the SF Weekly story. He has yet to return our call. Responding to earlier reports that Apple had tried to track down a lost iPhone prototype, Calderón told SF Weekly that in July, he was visited by six people – four men and two women – who wore badges and said they were San Francisco police officers. The six searched his home for the unnamed device and offered him $300 for it, but he told them he did not have it. One of the six visitors, SF Weekly says, then gave Calderón his phone number and asked that he call if he had additional information about the lost phone. This week, Calderón gave the phone number to SF Weekly, and when the publication called the number, the phone was answered by a man named Anthony Colon, who confirmed he was an Apple employee. 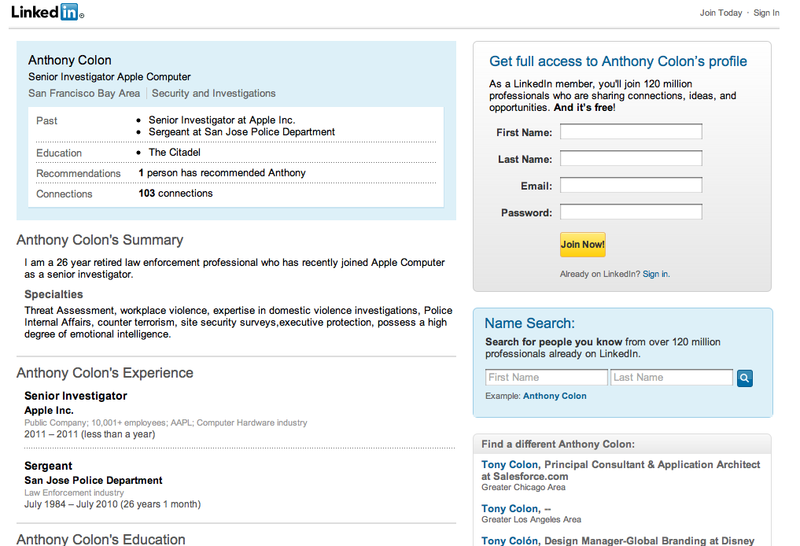 A LinkedIn profile – which has since been removed from the web – listed Anthony Colon as a former San Jose, California, police sergeant and a "senior investigator" at Apple. A copy of the profile is available here. The Register has spoken to Calderón's uncle, who said that there were three members of the household present during the search for the lost prototype and that none of them would be home until later Friday afternoon. The uncle said he was not present for most of the search. Earlier this week, CNet reported that an iPhone prototype was lost in a San Francisco bar in July and that Apple security personnel worked to recover the device over the next few days. Citing a source familiar with the investigation, CNet said that San Francisco police officers and Apple employees tracked the phone to the home of a man in San Francisco's Bernal Heights neighborhood – where Calderón lives – but that they were not able to find it there. This is apparently the second iPhone prototype Apple has lost over the past year and change. In 2010, an Apple employee named Gray Powell left an iPhone 4 prototype in a bar in Redwood City, California, and photos of the phone wound up on Gawker Media's Gizmodo blog. San Mateo County prosecutors searched the home of Gizmodo editor Brian Chen, but did not press charges against him or Gizmodo. Last month, however, prosecutors did file misdemeanor charges against two men who allegedly sold the prototype to Gizmodo. The two pleaded not guilty on Thursday. According to SF Weekly, Sergio Calderón said that the six people who searched his house did not identify themselves as working for Apple or say that the device they were looking for was an iPhone 5 prototype. "They said, 'Hey, Sergio, we're from the San Francisco Police Department,'" he told SF Weekly. They did ask, he said, if he had recently been to Cava 22, the San Francisco bar where CNet says the iPhone 5 was lost. According to SF Weekly, Calderón also said that his family members were "threatened" by the visitors. "One of the officers is like, 'Is everyone in this house an American citizen?' They said we were all going to get into trouble,'" he told the publication. He also said that he is a US citizen and that all the family members in his house are in the US legally.